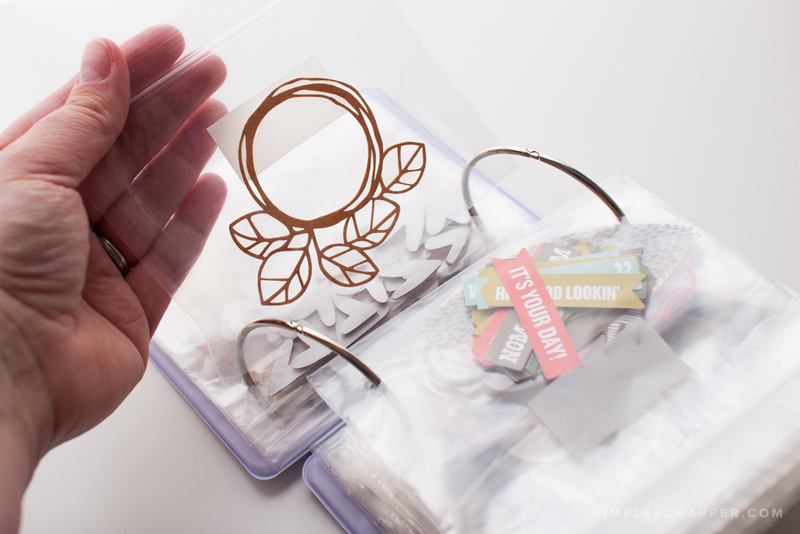 If you’re a paper scrapbooker, you’ve likely tried various approaches to storing your die cut pieces. Have you found one that’s just about perfect? Almost two years ago I saw an image on Pinterest of embroidery floss being stored in what was essentially a very tiny album. I was intrigued and began scouring stores to find the product. At first I thought a brag book might work, but the open pockets meant the items could fall right out. When it comes to all those little, mostly-paper pieces, durability and portability are key. And then I saw the most perfect option at Hobby Lobby: the Yarnology Poly Bag Floss Organizer System with Floss Binder (no longer available). For just $6 (two sets of bags and 1 set of covers) I could have a compact system to store 48 different groups of die cut pieces! 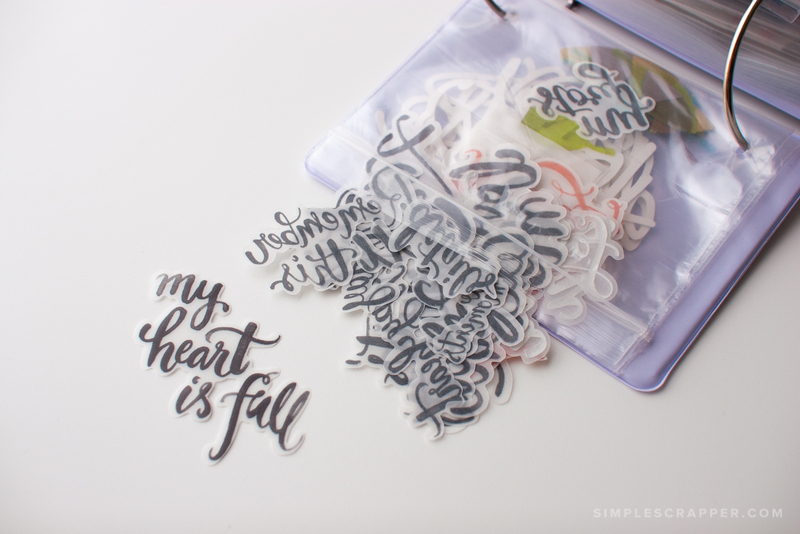 It’s kind of like a baby ScrapRack, just for my die cuts. 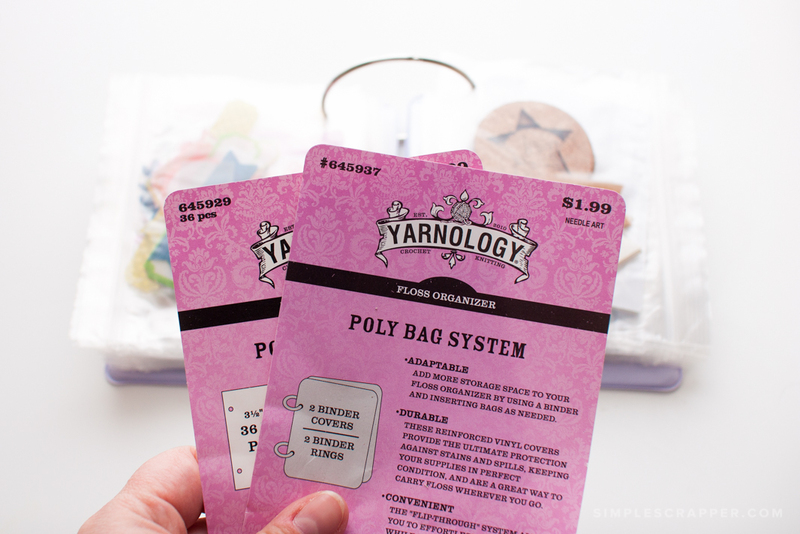 The best part is that each bag has a zipper close, so nothing will come out – until I want it to! Unless I was working with a kit, my die cut pieces used to get overlooked. 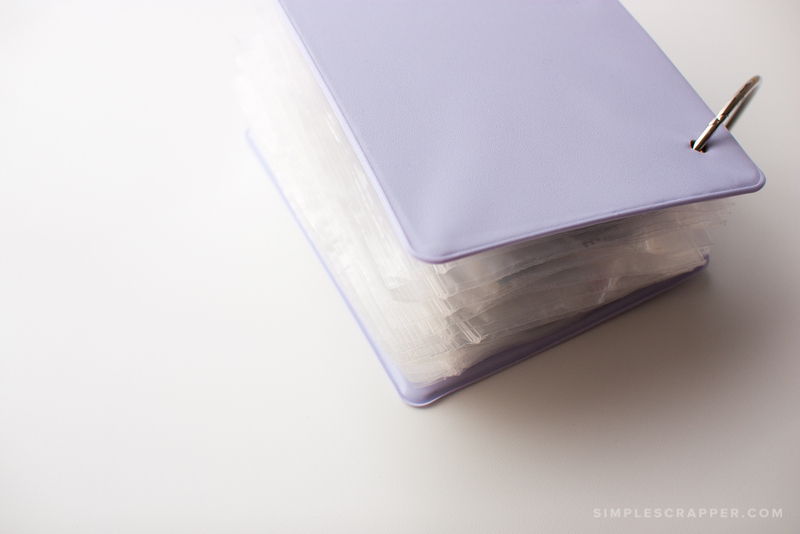 Now I keep my die cut binder open all the time, making it easy to flip through and find just what I need. Fascinating! 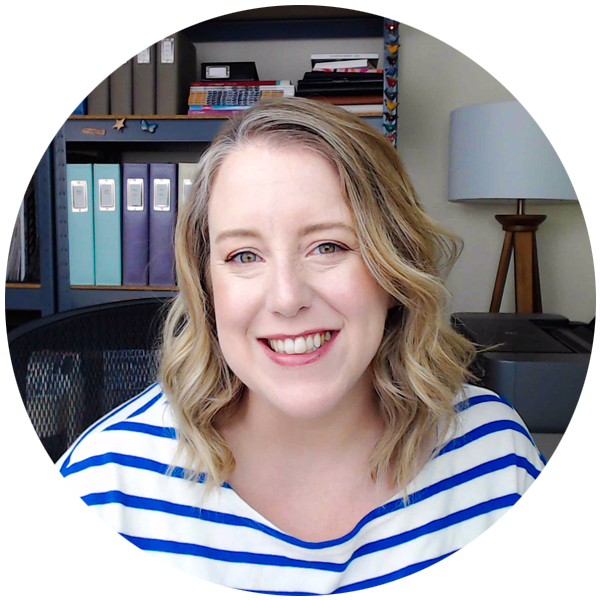 I have always put die cuts in a storage binder by theme or color, but it is sooo big and takes 28″x14″ to open! I love this small, workable solution! May have to try this. I shop Paper Wishes a lot and I’d like to keep kits together but that tends to take up too much space. This could work with the die-cuts that are part of the full kit. Some of them are also meant to make 3D objects and all the pieces would be right there waiting to be used. (And more likely to be used as well.) Headed to Santa Fe today – make make a stop at Hobby Lobby. OMG, I have three of those with the zipper bags and I’ve used them for about 10 years now. I have sort of forgotten about them recently, so apparently it’s time to clean them out and use them for something new. Thanks for the reminder! This is extraordinary! I have my diecuts in a box. But it’s so hard to sort through them! Absolutely heading to HL to grab some of these! 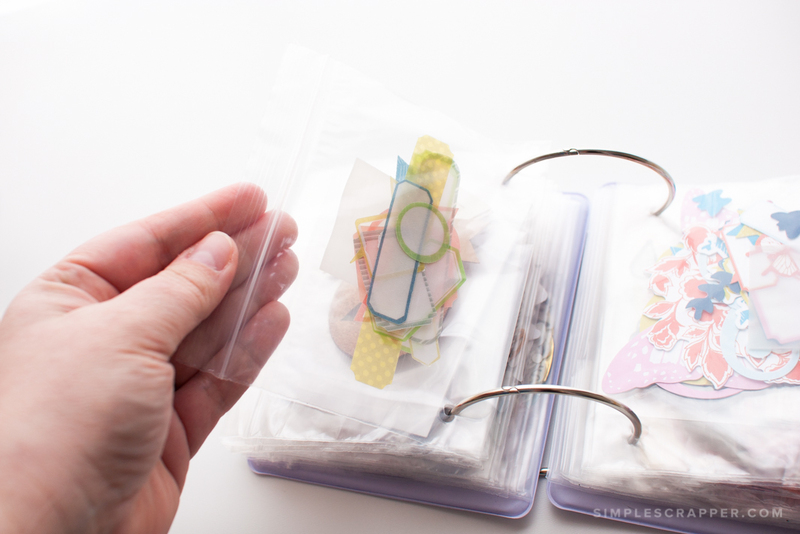 I think I can get zipper bags like these at my local Bagmart – and use a couple of chipboards left over from a mini album … I have the large rings, and a hole punch. I can paint the covers and then spray them with acrylic so they won’t wear out. 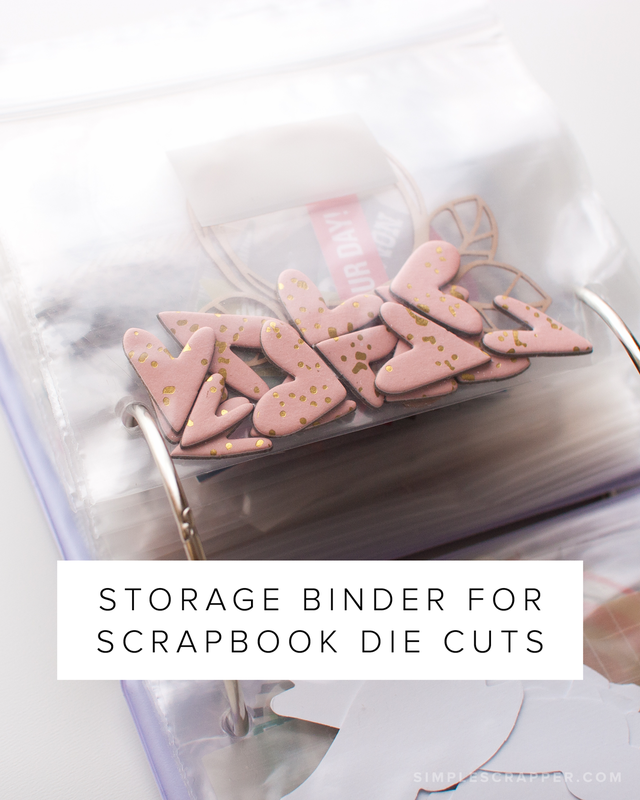 This is genius, I love using binders for scrap stuff but couldn’t find a solution other than a million ziplock bags for my diecuts, they are one of my most used supplies. Being able to flip through them like that would certainly add mor joy and ease to my scrapping. Living in Australia, there’s obviously no Hobby Lobby anywhere near me but LCJinRoslynPA your DIY version sounds totally doable. Thanks for the great idea. What a great idea! I wonder if these are available online anywhere. Thankfully I saw this prior to heading to Joann’s today. I bought two sets of bags and one set of rings. I didn’t see a cover. Hmmm. Should I look at HL or call it good enough??? Very excited to have my little bits and bobs gathered in a small space. Thank you, Jennifer! I just love this idea. So much so that I tracked down the only yarnology products on the web. To be delivered tomorrow and I love the potential of it all. I have started using this idea. Love it! I hang it up so I can find it easy. Would you kindly advise where this storage “system” is sold? I think I bought mine at JoAnn’s. Jennifer’s post mentioned Hobby Lobby. I love the set-up I copied from Jennifer! Love this idea! thanks so much! 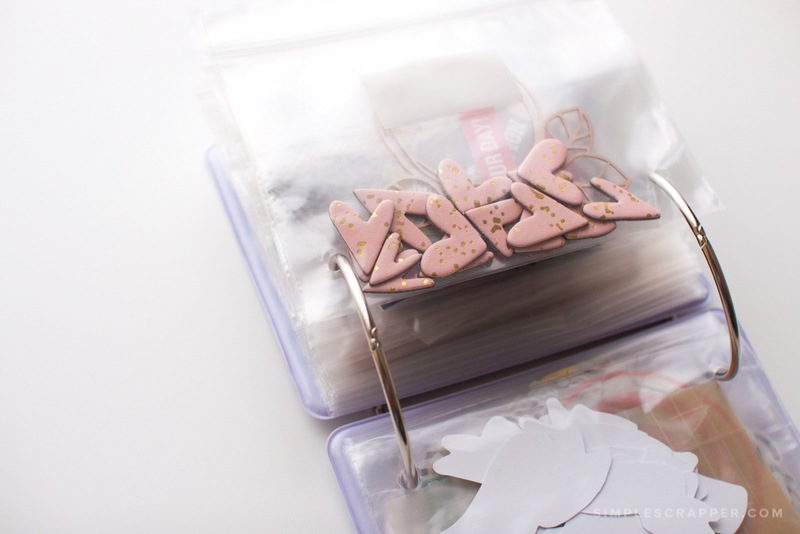 I will be making my own using the zipper bags and will attach to the “hole” end and reinforcement card stock strip for the rings to go in without tearing and front and back covers….this is such an amazing idea to cure my problem of loosing all of those die cuts which I spend hours cutting. No more waste for me. I like this idea a lot. I’ve tried a few different ways to store and haven’t been completely happy with either one. Love the price on this–it’s perfect for giving it a try. I am glad I found this post. I am so gonna do this. I will be going to Hobby Lobby in 2 days so I am definitely getting the stuff. Thank you so very much Jennifer!! I was getting discouraged but not anymore. ???? Yay! So glad to hear you’re feeling optimistic, Nina! Do let us know how it goes!